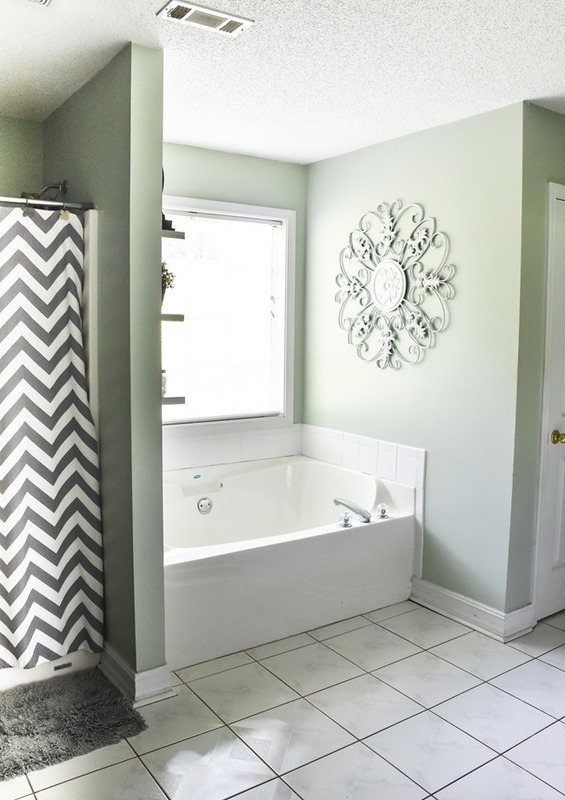 So, for this challenge I chose to tackle my Master Bathroom! If you are new to the blog, we moved into a fixer upper home 2 years ago when I was 36 weeks pregnant… so needless to say it has been a journey of making this house into our home. 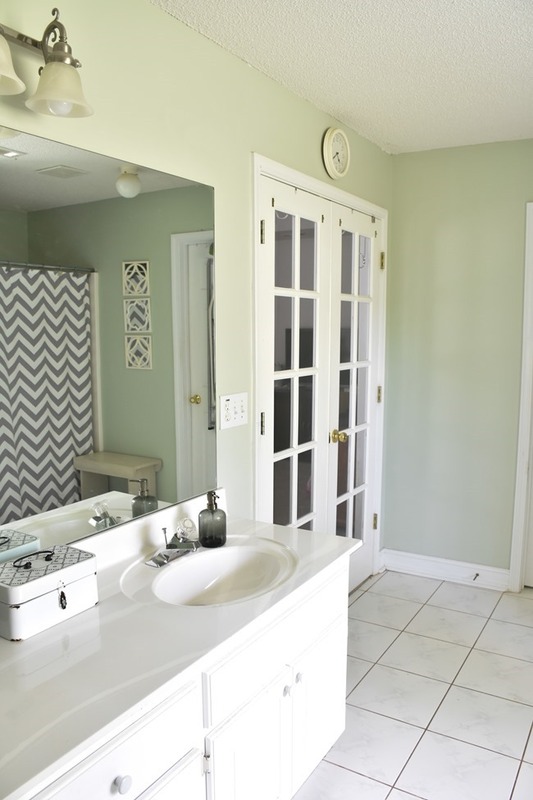 In fact this bathroom was the very last room that hadn’t been painted since we moved in, so I did a little happy dance as the paint was going on the walls this week – finally my whole entire house is painted in colors I chose! So let’s take a tour of the before of the room and I will lay out my plan of what I hope to tackle this month before the big reveal! 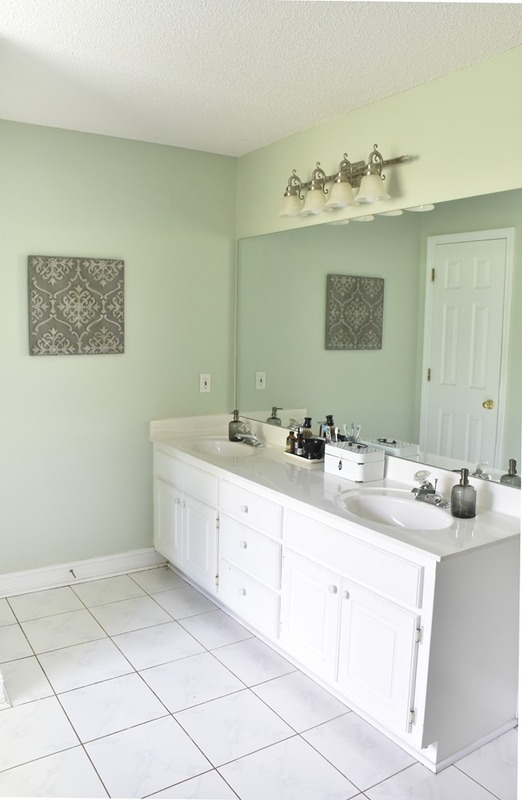 In our last house our master bathroom was painted in a very dark gray and I had a lot of light gray and white accents/accessories. 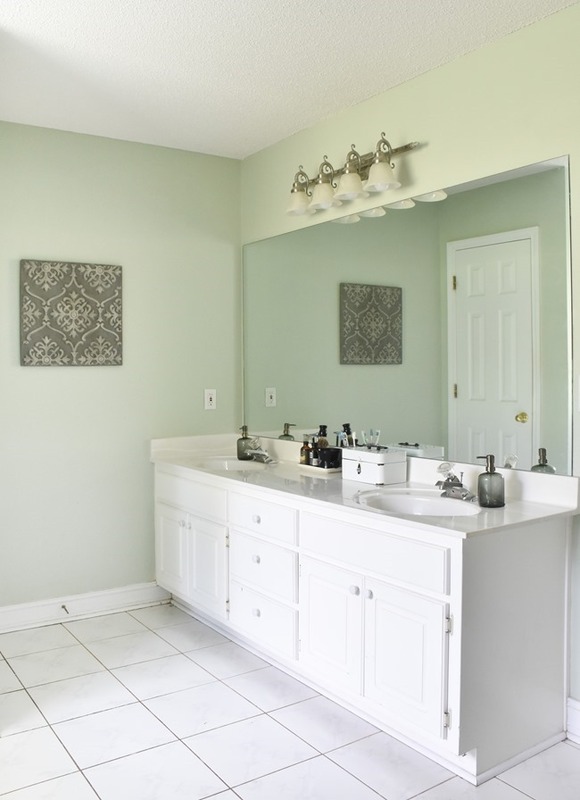 So it was easy to just bring in all my gray and white decor/accessories in this bathroom and it worked well with the soft green paint color. 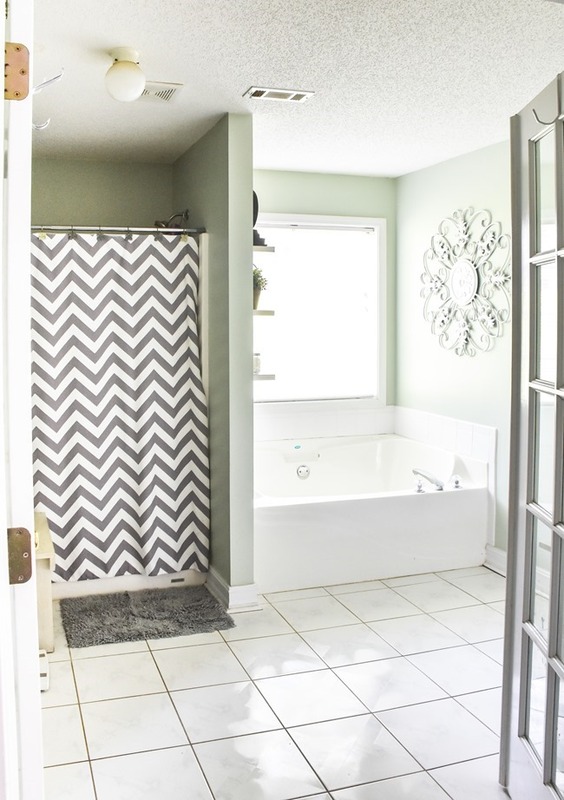 This room gets a lot of light because of the big window and also has a lot of white in because of the white tile floor, tub, vanity, and ceiling. Definitely not a bad room but I am ready to put my stamp on it and make it way better! 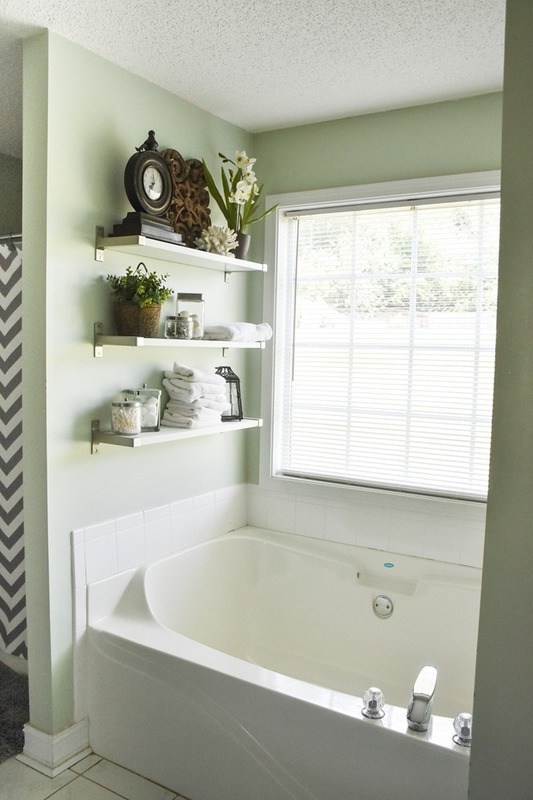 The white shelves and all that decor came with me from our last master bathroom. 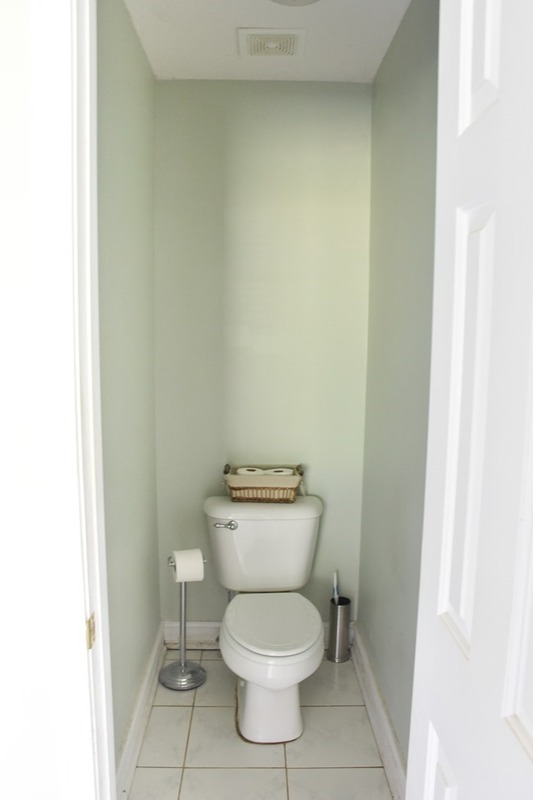 There’s a little toilet closet/water closet too. So this is quite a big room to work on and I have a pretty big list of things I want to do! It is going to super tight for me to stick to $100 budget and I am going to have to get creative with some things to make it work! We don’t have any kind of towel rack so I need to add that.. also no curtain on the window so I am hoping I can find or make something and it fit in the budget to buy a rod too. The shelves will stay but I am sure the decor will get rearranged a bit. I will have little to no budget for new decor this time so I am going to have to get creative and shop the house or maybe make something if I want any new decor. I have big plans for this little room too! 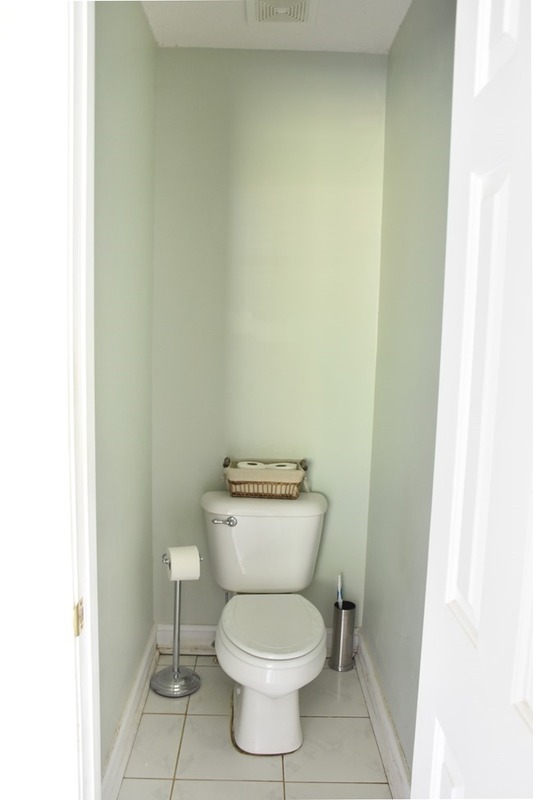 I want to add some character so it doesn’t just look like a toilet stuck in a closet. So I have several things I’d like to tackle in here and hoping they all will fit in the budget. Check back every Wednesday in September to see my progress and I will probably have a few extra posts on other days since I have quite a few projects I hope to show you in here. Then the last Wednesday of the month will be the final reveal and before/after! I can’t wait! If you ever want to join me in doing a challenge like this, feel free to hop in and join me and let me know!! I’d love to see some of my readers do a room makeover in their home in a month with $100 or less! There is a whole bunch of other bloggers doing the $100 room challenge this month too, including Erin at Lemons, Lavender, Laundry, and my good friend Molly from Pennies’n Grace so be sure to check out the rooms they chose, before pics, and what they plan to accomplish this month in the linkup below. your shower curtain is so fun! This is such an awesome bathroom! So much potential, can’t wait to follow along! I’m so interested to follow this transformation because the room already looks so pretty with all that natural light. I know it will be gorgeous when you’re done! Your rooms always turn out to be stunning, and I’m sure this will be no exception. I feel like we have a lot of similar goals for our bathrooms this round, so let’s do this! YAY! I can’t wait to see the transformation in the space! What a great bathroom! I can’t wait to see what you do in the water closet! What a great space! Can’t wait to see what do in here! 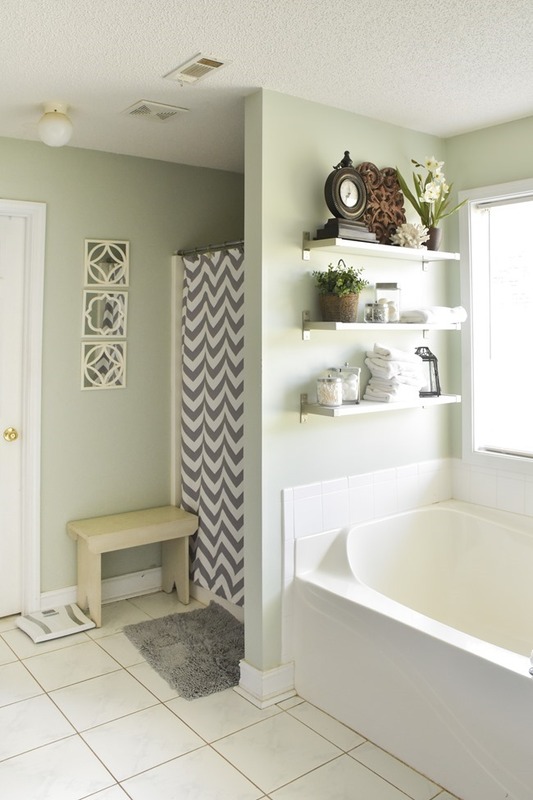 I am excited to follow your bathroom makeover! You have so many fun ideas. 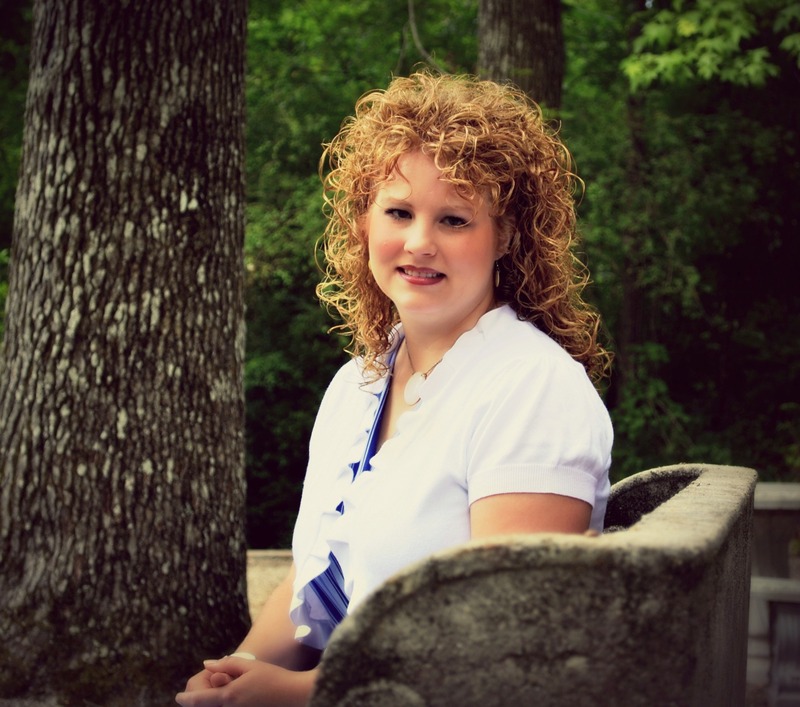 I wish I had your drive and energy! Beautiful bathroom! Excited to see the makeover! Your bathroom reminds me so much of the master we had at our old house. I think I even had it painted a similar mint green color. I can’t wait to see how you change up this space!